Domestic Sluttery: There's No Such Thing As Too Much Bling When It Comes To A Cocktail Ring! There's No Such Thing As Too Much Bling When It Comes To A Cocktail Ring! At Domestic Sluttery HQ, you know we adore sipping cocktails and wearing pretty cocktail dresses. Therefore it's fairly essential that we have suitable accessories. Such as a ridiculous statement cocktail ring. Or two if we're feeling particularly decadent. If you're after something a little more sparkly, Pearl And butler also have this rather sparkletastic pink diamanté circle ring which would co-ordinate so nicely with a Pink Gin don't you think? And at only £14, you'd still have change from a crisp £20 for a drink! For all out bling and glitzy glamour though, you'd need to find £3,600 for this fantabulous Bombe ring by Kiki McDonough. 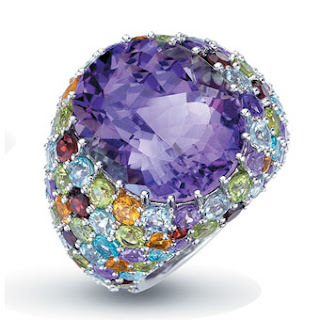 Packed with amethysts, garnets and blue topaz, it is a rather lovely thing indeed. LOVE Murano glass. Love those rings. So shiny.